Organising an event can be incredibly time consuming and expensive, if it is not your core competence. This is where Events De Valor managed events can help organising events and is what we do. 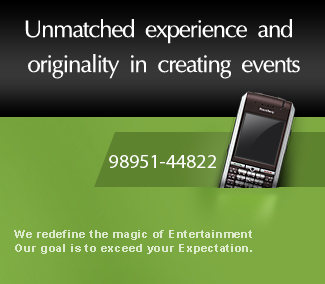 Events De Valor can supply you with complete event management, at the best locations in Kerala. Whether it's an Exhibition, Stage Show, Seminar or Workshop, Conference, Press Meet, Product Launches, road Shows, Wedding, function or other event, we offer one on one consultancy, to help plan your event - to make it an event to remember! "We're only happy when you're delighted!" Our values define our behaviour, signpost best practice and arbitrate at times of disagreement. We are the partner to advise you and manage your event anywhere in Kerala, with a team on site that speed up the preparations, adding value with the destination knowledge and reducing costs.